well, number one thing is you can save more! There’s limits you can contribute but if you have 2 accounts, it’s effectively doubled. This looks great. Congrats. I think integrating the savings into your budget is essential, so that’s great. Forgive me if I missed the discussion, but have you considered delaying the 529 openings until after you’re maxing out your Roth? They can get a loan for school (if they go; or pay as they go, or get scholarships, etc. ), but you can’t get a loan for retirement. Also, I believe you have the option to make a no-penalty withdraw from your Roth for your kids education, if you choose and if needed at the time. I really haven’t weighed all the options yet for the 529 accounts. My thinking is that I’d be contributing very little initially (basically the amount I would have spent on a party or gifts for their birthdays). But I definitely want to do more research before making any firm decisions so thanks for the info! Most banks have a notary…I am sure some bank employees can be your witnesses. Not true for our wills. We went to the bank to have our power of attorney forms notarized and (1) they would/could not serve as a witness, and (2) said they do not notarize wills. I don’t understand why since it’s not like they are an interested party (in the event of one of us dying), but that’s what we were told. My coworker ran into the same thing trying to notarize her will at the bank. What a pain!! Ashley – I set up 529 accounts online for both my niece and nephew, and I put $ in there anytime I would normally give them a gift. My sister also puts most of the kids’ gift money received from others in these accounts. Each state has its own plan, but in NC, the minimum contribution is only $25. If you choose to use the plan in the state where you reside, you may get state tax benefits when you file your taxes. You just pick which investment fund you want to put your contributions in (I chose an Aggressive Track fund based on age of the beneficiary – kind of like a target retirement fund), and contribute whenever you’d like. I do agree with Jenna about the ability to take loans for school vs. retirement, but I also find greater satisfaction in gifting to their 529 plans instead of buying more stuff they really don’t need. I think it would be fine to open them for gift purposes to begin with, and decide about regular contributions once you feel comfortable with your own retirement savings plan. Thanks for motivating me to keep pushing my husband to become “adults” too. We are making slow progress… this month we combined car insurance policies. Next month, I’m on a mission to open our joint savings/investment account and start contributing monthly. We haven’t put each other on all our accounts yet because he is self-employed, so we’ve just kept everything separate. Need to work on that! I’ve seen the effects of both well- and poorly-planned estates, and it’s a stark difference! I don’t know the answer, but if you move to another state do the 529s transfer? What if a child decides to go to technical school? I’d save for retirement until you have maxed out Roths for both of you and get your loans paid off before opening another savings vehicle no matter how good it might make you feel. If you stopped adding unpaid interest to your student loans you would have the money to invest! There is no need to transfer between states. You can choose to save using any state’s plan, but that doesn’t affect where you use the funds. As long as the funds are used for tuition/fees/books/room/board at an eligible institution (an institution eligible to participate in financial aid programs by US Dept of Ed. ), there is no penalty for withdrawal. You would have to check with the administrator of the plan you choose to find out about specific vocational schools, etc. If you withdraw your funds for any other reason, a 10% federal income tax is imposed. I wouldn’t set up a 529 because it “feels good,” but because I would be putting money I would spend regardless to better use. Just to clarify my earlier comment, Ashley, the income tax and a 10% penalty would be charged on the earnings only – not contributions – if withdrawn for noneducational purposes. Unless your state offers a good incentive to contribute to the state plan (some offer tax breaks) there is no reason to buy the plan run by your state. Where the money is invested has no bearing on where it can be spent. Do some research on the plans and pick the one that offers you the investment options you want with the lowest fees. I guess you only thing that stands out to me is that I’d like to see you work on getting the dental issues for your husband resolved. While I do think it’s important to save for retirement, I worry about those dental costs and would have liked to see you take that $1000 and get started on that dental work. I had an exam and needed a filling (would have been $119 after the discount) and four days before my appointment to get the filling fixed, I had incredible pain and ended up having an emergency root canal and that cost me $1700 after my 30 percent discount. (That was for the root canal and a crown.) If you wait too long, then some of those that are actually fillings might end up being root canals and it will really cost you a fortune, let alone all of the pain. So I’d really like to see you start addressing that. Just a thought. I work in our local city hall and we have two notaries on staff – you may want to call your city hall or county building. We get pulled all the time to be witnesses, so maybe the city staff will be your witnesses. I guess since we’re (clearly) not even close yet, I wasn’t even thinking about that! I just want to say that I love this “series” on becoming an adult. Great goals, and things we should all have in order. Thanks for sharing your journey! Since you are both self-employed, you really need to look into retirement accounts that will save you money on taxes, especially since you are renters and aren’t able to take the deductions that homeowners can. I know you want to focus on your debt, but you could be missing out on some big tax breaks that may allow you to save for retirement without significantly changing your take-home pay. We fully funded my Traditional IRA ($5500) this year and received a $2500 refund instead of owing taxes. I’m not sure if you already have an account at a credit union, if not, you may want to join to have access to their notary services along with the other benefits. They are generally more flexible about notarizing documents than commercial banks. Along the same lines, do you have an HSA with health insurance? If you do I would start setting aside money in there for any planned dental work. Its tax free! If you are paid out of your direct deposit it is also not taxed by SS and FICA which could be another 8-16% savings (depending on how it works for being self employed). I don’t have an HSA, but that’s a good point regarding the savings and tax-free nature! Might be worth it to check into them and maybe set one up??? I can add it to my “adult” list to check into further. Oh man, I just talked to my hubs about this. I know a Roth is pre-tax, so that helps with taxes (but it’s a pretty tiny deduction at only $1,050), but I never thought about if there were other potential tax breaks. If we can add more and it means less money to Uncle Sam, then that sounds like a good plan to me. I’ll have to check into it further. Actually your contributions to a Roth IRA are made post tax, then the balance can be withdrawn tax free. Contributions to a Traditional IRA are deductible, subject to some eligibility requirements, and then the distributions are taxable. Oh man, thanks for the clarification and the link!! We just set up a 529 – the other great thing about them is a lot of companies will set up “online gifting”, so you can ask relatives to contribute to the 529 for birthdays, etc instead of buying more stuff for the kids. The tax benefit of the Roth IRA is actually that you withdraw the earnings after age 591/2 tax free. You won’t see a benefit on your current year’s taxes. If you want to reduce your current taxes, you should contribute to a Traditional IRA. Of course, with a traditional IRA you will pay taxes on the earnings and growth when it comes time to withdraw the money. The basic rule of thumb is if you think you will be in a higher tax bracket during retirement, you should use a ROTH. If you think your tax bracket is higher now, you should use a traditional. Since no one has a crystal ball, it’s a bit of a guessing game. But it’s better to contribute than not, no matter which version you choose. Since you are both self-employed I believe it would be more beneficial to create a SEP 401k. Contributions are pre-tax. Depending on how you set up your business, you can add much more than the 18000$ max that salaried individuals have. You can set up your business to pay you “matching employer contributions” up to a certain amount/percentage. This could reduce your taxes much, much more. 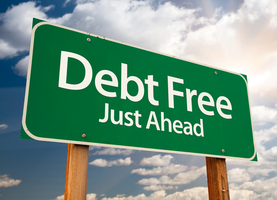 Definitely worth looking into once you reach a level where your debt payments are going to retirement instead! On the HSA, if you have a high deductible plan you can set one up. You will need to check to see if you can open one mid-yar or wait until the next annual process. Its not a “use it or lose it” account which is great. And the funds are still there and available even if you switch insurance or carriers. Its eligible for medical and dental expenses. Its a great safety net and the only pre-tax account that isn’t subject to FICA if you contribute in a certain way.